Oscar Muller, who was held in three different concentration camps during World War II, sailed from Belgium to the U.S. after he was liberated in 1945. New York City is pictured in the background. This article appeared in the GF Post Star on August 22. Mr. Muller was liberated on this train near Magdeburg. Ironically one of his liberators, Carrol Walsh, lived 5 minutes away, but they were never able to meet. What are the odds, but then, there are no coincidences. I’ll post more on his life later. As a young man, Oscar Muller knew when trouble was brewing in the Janowska concentration camp in the Lvov ghetto of Poland. Whenever the Nazis planned to round up Jews and lead them to their death as part of a “selection,” Oscar was forewarned by a premonition — the screech of a train whistle that blared in his head. He’d frantically seek refuge by holing up in a nearby attic or cellar, or fleeing over a fence until the danger had passed. Then he’d go about foraging for scraps of food. It was all part of just trying to survive during the horrific years of the Holocaust. Oscar, of Glens Falls, died July 31 at the age of 103. The youngest of eight children, he was studying architecture in his native Poland in 1939 when the Soviets forced him and his family out of their spacious apartment. As bad as it was to be occupied by the Russians, life for the Jews became worse when the Germans invaded. The terror started in 1942, Oscar stated in a diary about his life during the Nazi occupation. Joy Muller-McCoola, Oscar’s daughter, said her father watched most of his family, save for one brother, be murdered by the Germans. Oscar, however, never doubted he would be able to survive the atrocities. “He was incredibly optimistic,” Joy said. Oscar was imprisoned at three different death camps and did what was necessary to stay useful to his captors, but would never submit to being a “policeman” for the Nazis, mornitoring the movements of other Jews. At Bergen-Belsen in northwestern Germany, Oscar reported to an “oberstrumfuhrer,” who ordered that he keep track of the prisoners who were either sick or dead. Joy believed it was because her father had training in architectural lettering and numbering that he was kept alive. Oscar also tried to keep peace among the 100 starving prisoners held in the crude barracks at Bergen-Belsen by cobbling together a scale out of two pieces of cardboard, string and a piece of wood to weigh out the one slice of bread allowed per person each day. A young boy who was held at the concentration camp remembered Oscar making the scale and later, when Martin Spett became an adult and made his way to the United States, he became an artist who painted vivid memories from the Holocaust, One work in Martin’s “Reflections of the Soul” — a collection of his pieces — shows a man cutting a very thin slice of bread surrounded by a gaunt-looking crowd of prisoners. Oscar was the younger man weighing the bread on the primitive scale. To keep the prisoners’ minds active, Oscar made a chess set out of scraps of wood. He also scrounged for food to feed a starving rabbi, making off with scraps while carrying kettles back to the kitchen. Joy said at first her father felt guilty for having stolen, but the rabbi convinced him otherwise. Not surprisingly, Oscar’s life was forever shaped by the events of the Holocaust, as were the lives of his children and grandchildren. Oscar was a gifted photographer who appreciated beauty, said his son, Dan; he was also known as “the man with the golden hands,” replicating anything after looking at it just once. 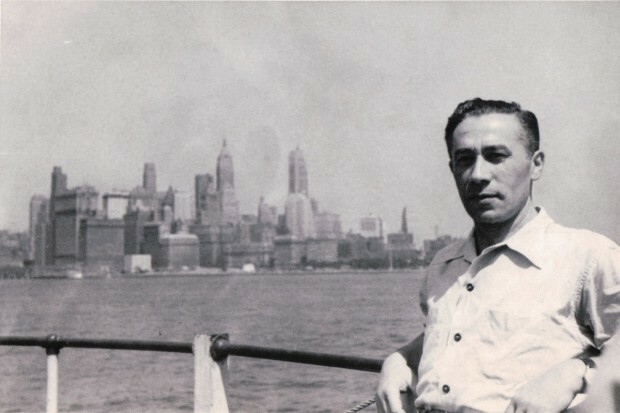 After Oscar was freed from the concentration camps, he sailed to New York from Belgium in 1949. He regularly rode the subway into Manhattan looking for work and met someone who made handbags. He went to a couple of interviews, saw what the designers were doing and drew up a portfolio, which he then turned into a long career as a one-of-a-kind handbag designer. Oscar crafted furniture for himself and his wife, Lily, in their Bronx apartment, including cupboards with broomstick handles and a daybed with storage compartments. “Any of those pieces could have been in the Museum of Modern Art’s design collection and it would have looked fine because that’s what he did,” Joy added. Oscar also worked through some of the “damage” from his death camp experience with his three-dimensional art. One particular piece hangs on the wall in Joy’s Glens Falls home. It is a square picture with cage-like bars made of nails around the perimeter, and a broken eggshell and human eyeball painted in the center. Dan and Joy interpreted the art to mean that their spunky father watched himself build a new life after breaking free of the bonds that once held him. “He was resilient,” Joy said. Copyright 2011 The Post-Star. All rights reserved. hi Jamie, I remember you well….I’ll share your comments with Oscar’s family, You know that the small stuff doesn’t matter at all…People puff out their chests and think they can control or influence- but we have to decide what really matters.